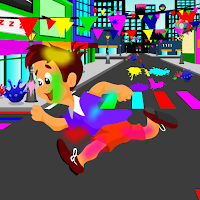 Escape Happy Holi is a free online games to play from ajazgames. holi is colourful day celebration happens on every year in India, its the story of krishna legend, in Barj region of India, where hindu deity Krishna grew up, the festival is celebrated until Rangpanchmi in commemoration of the divine love of Radha for Krishna. The festivities officially usher in sprin, with Holi celebrated as a festival of love. enjoy playing the latest game with new ideas and thoughts have fun playing. keep playing new escape game from ajazgames.